That is the main conclusion of Australia’s Environment in 2015 – an environmental score card and accompanying data explorer that we have just released. Australia’s natural environment is the bedrock of our economy, and our unique ecosystems and landscape are a fundamental part of our society and national identity. This latest report shows that for most of the country, our environmental fortunes are closely tied to the highs and lows of rainfall. We combined and analysed huge amounts of satellite imagery, ground data and landscape modelling and compiled this data into 13 environmental indicators. With most data extending back to the year 2000, we can start to see how Australia’s environment is changing over time. National level environmental indicators show that soil moisture and river flows fell to near record lows in 2015, while tree cover continued its decline to reach the lowest level since 1972. Soil exposure, the lack of protection from vegetation or mulch cover, also returned to levels last seen during the drought. Many of these changes are strongly driven by changes in rainfall. Other processes also play a role, however. For example, some of the estimated 530,000 hectares reduction in forest area in 2015 was due to clearing, particularly in southern Queensland, where around 300,000 ha were cleared in 2013-2014 (land clearing data for 2015 are not yet available). We can combine some of these indicators to get an overall score of the environment’s condition. Such a measure can only ever be an artificial and subjective index, similar to composite indices used for the economy, for example. But because most environmental indicators are strongly linked to water availability, the overall pattern still remains similar if different calculations are made. The national environmental score declined from around average in 2014 (4.8) to well below average in 2015 (3.6). This is a cause for concern, particularly given the relatively short time since the plentiful rains that saw off the drought in 2010. While useful to understand general trends, the national indicators hide much regional variation. 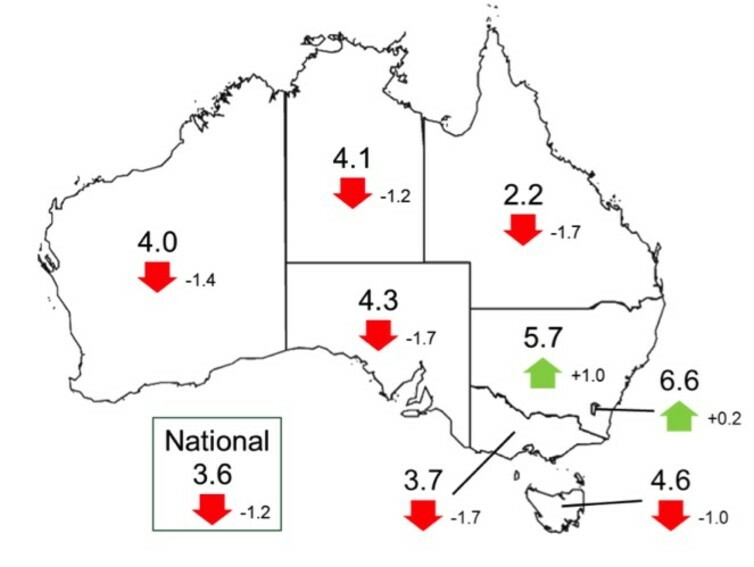 For example, scores increased to above average values in the Australian Capital Territory and New South Wales, which received good rains across most of the state in 2015. 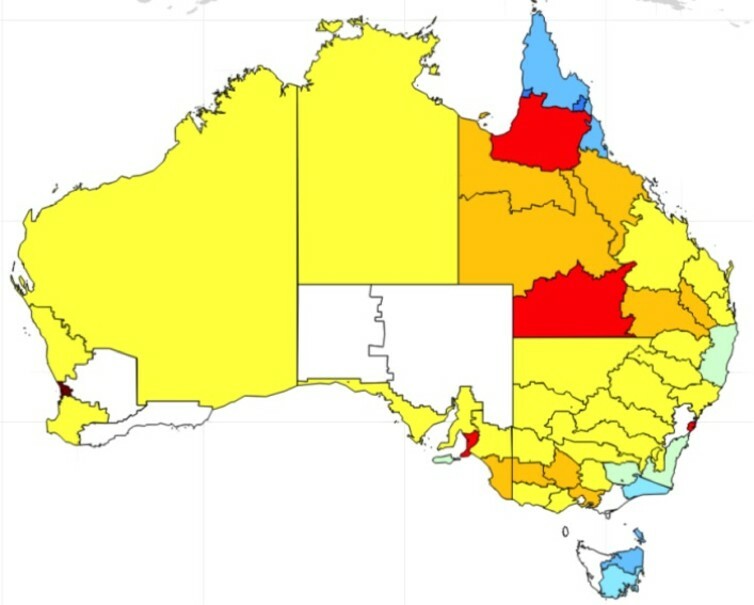 On the other hand, in Queensland conditions were already relatively poor in 2014 and declined further in 2015, in some parts of the state to the worst conditions since at least 2000. The different indicators also did not always change in the same way. For example tree cover declined in all states and territories except in Tasmania, where new plantations exceeded harvesting rates. (These numbers do not include the impact of large bushfires in early 2016). 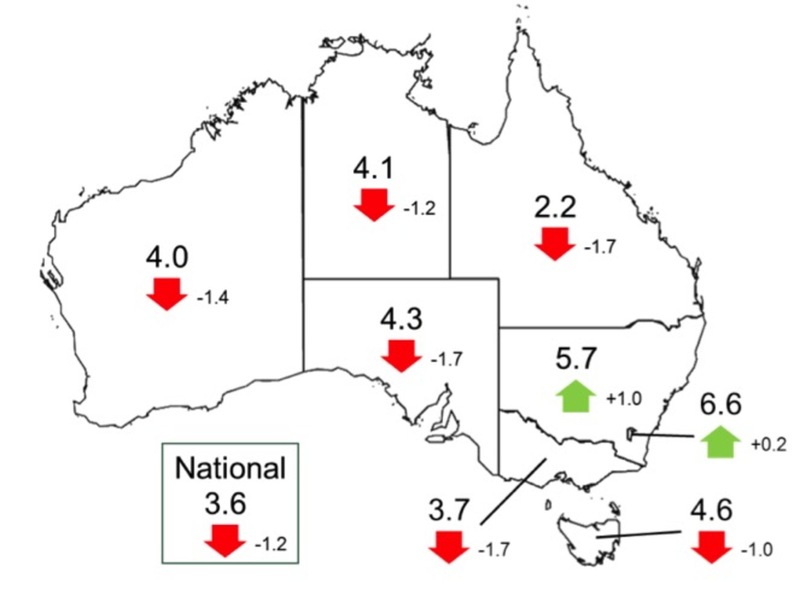 Tree cover also increased in some other regions, whereas relatively strong losses occurred not only in Queensland, but also as a result of urban expansion in most metropolitan areas. The Millennium Drought was arguably the worst drought on our historical record. Lasting around a decade, it had profound impacts on water resources, rivers and wetlands, ecosystems and agriculture. The very wet years that followed brought some much needed relief to the desiccated ecosystems. Unfortunately, our report shows that the bounce was short lived, and that environmental indicators are once again in the red. While this is a concern, we are still some way from experiencing the worst impacts of the Millennium Drought. We have only had three years with relatively low rainfall rather than ten, and some of the events that occurred towards the end of the Millennium Drought have not yet come to pass. For example, many wetlands in eastern Australia have declined in extent, but not quite yet to the record lows observed before. The same is true for many of our water storage reservoirs, which have returned to the low levels seen during the first half of the last drought, but not yet the lows of later years. Still, it is concerning that the lean years have come back so fast. Apparently, the rainfall abundance of 2010-2012 did not create a long lasting reserve, once more leaving our environment exposed to the next drought. Indeed, we may already be in it. The link below is to an article reporting on the shark fin industry.